If you’re new to building you’ll know that it’s a unique and often confusing realm, complete with its very own ‘language.’ Building talk can cause unnecessary stress in many first homebuilders and renovators, but at Merino Homes we believe that the journey of building your first home should be as enjoyable as its destination. To make it easy for you when building we’ve created a quick reference dictionary to help you understand building jargon. 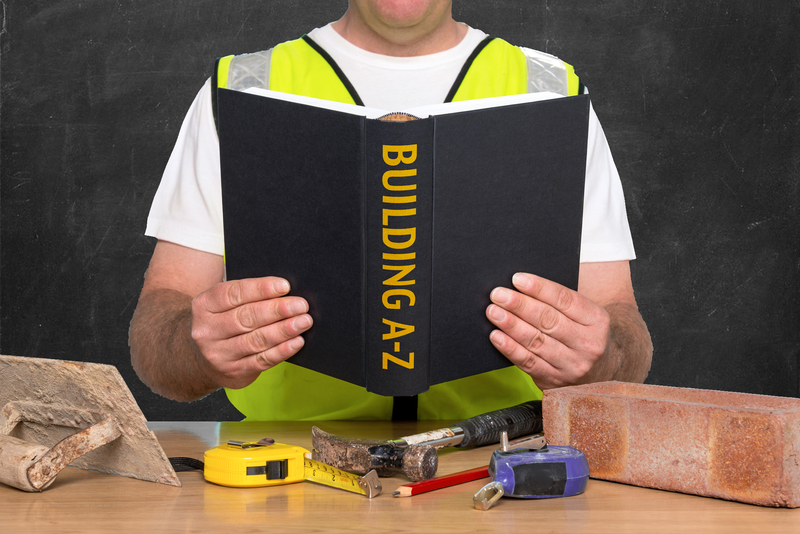 Trying to not overwhelm you with unnecessary terms and extensive descriptions the ABC of building terms, building dictionary is a quick reference guide for onsite meetings, quote assessments and more. See if you can find the terms where we have a little fun with our trades onsite. A/C – an abbreviation for air conditioner or air conditioning. Acoustic batts – sound-insulating material used for noise reduction. Aerator – the round screened screw-on tip of a sink spout. It mixes water and air for a smoother flow. Aggregate – a mixture of sand and stone and a major component of concrete. Air space – the area between insulation and the inside of an exterior wall. Allowance(s) – a sum of money set aside for items that haven’t been selected and specified in the construction contract. Anchor bolts – bolts that secure a wooden sill plate to concrete or masonry floors or walls. Apron – a trim board installed beneath a windowsill. Architect – someone who has completed a course in building and design and is licensed by the state as an architect. Architrave – the moulded section covering the joint between a window or doorframe and the wall lining. Often made from pine or MDF. Australian Standards – mandatory documents referenced in the Building Code of Australia (BCA). BAL rating – Bushfire Attack Level. This indicates the construction requirements for building within a medium threat bushfire-prone area. BASIX – Building Australia Sustainability Index. A scheme introduced by the NSW government to regulate the energy efficiency of residential buildings. A legal requirement for a new home or for any alteration or addition valued at $50,00 or more. BCA – Building Code of Australia. All building work must comply with the requirements of the BCA. Volume 1 and 2 are part of the National Construction Code series published by the Australian Building Codes Board. Backfill – the replacement of excavated earth into a trench around or against a foundation wall. Bagging – a process in masonry in which a thin mortar is applied to a surface with coarse material, usually imparting a textured finish. Balusters – vertical members in a railing used between a top rail and bottom rail or the stair treads. Sometimes referred to as 'pickets' or 'spindles'. Balustrade – the rail, posts and vertical balusters along the edge of a stairway or elevated walkway. Barge – a horizontal beam rafter that supports shorter rafters. Bargeboard – a decorative board covering the projecting rafter (fly rafter) of the gable end. At the cornice, this member is a fascia board. Batten – a length of square timber or metal used to hold something in place or as fastening against a wall. Batt – a section of fibreglass or rock wool insulation of varying width. Sometimes "faced" (meaning to have a paper covering on one side) or "unfaced" (without paper). Beam and joist floor – beam and joist arrangements can form a supporting frame for a floor. Beams are thicker and longer and are laid vertically; joists are typically shorter and lay across the beams to give them horizontal support. Beam – a structural member transversely carrying a load. Sometimes called a "girder," these are often used in open plan homes. Block out – when material is installed into a wall for additional support for hang items such as handrails and towel rails. Brick tie – a small, corrugated metal strip that connects the internal wall sheeting to external masonry walls. Building codes – community ordinances governing the way a home may be constructed or modified. Bulkhead – a feature used to cover a change in ceiling heights. Often used in kitchens to fill the space between the top of cupboards and the roof. CC – Construction Certificate. An assessment on the construction of the building that needs to show the building both above and below the ground. CSD – Cavity Sliding Door. This where a door will slide into a cavity in the wall instead of swinging in or out. Circuit Breaker – a device designed to shut off the power to portions (or all) of the house; and to limit the amount of power flowing through a circuit (measured in amps). 110-volt household circuits require a fuse or circuit breaker with a rating of 15 or a maximum of 20 amps. Circuit – the path of electrical flow from a power source through an outlet and back to ground. Clip ties – sharp cut metal wires that protrude out of a concrete foundation wall (that at one time held the foundation form panels in place). Cornice – an ornamental or decorative moulding installed at the junction where a wall meets the ceiling. Course – a row of material in parallel layers, such as bricks. Covenant – an agreement that creates an obligation on the owner of a property not to do something. For example, a covenant could state that no more than one dwelling may be built on the land. Cricket – a second roof built on top of the primary roof to increase the slope. Designed to encourage water drainage away from the chimney joint. Crossover – the access point from the street to the block. For example, where a driveway is put. DA – Development Application. A formal request to carry out development. This type of Development Approval is the most common way of getting development consent in NSW. Even with a DA, construction cannot begin until you have obtained a CC – refer to CC for more information. Dado – the lower portion of the wall in a room, near waist height, usually with a different or contrasting surface treatment. Doorjamb – the surrounding case that a door closes into and opens from. It consists of two upright pieces, called side jambs, and a horizontal head jamb. Double-glazed – two glass panels with a sealed air space between them, designed for energy efficiency and noise reduction. Ducts – part of the heating system. Usually a tunnel made of galvanized metal or rigid fibreglass, which carries air from the heater or ventilation opening inside. Easement – the right to make use of the land of another. Eaves – the lower portion and edge of a roof that overhangs a wall. Elbow – a plumbing or electrical fitting that lets you change directions in runs of pipe or conduit. Electrical Rough In – when an electrician lays cable for the project. Elevation sheet – a page on the blueprints that depicts the house or room as if a vertical plane was cut through the structure. Extras – additional work not included in the original plan, which is billed separately. Facing brick – the brick used and exposed on the outside of a wall. Facing bricks usually have a finished texture. Fall – the amount of slope on a block, or the height difference between the door and drain in a bathroom allowing water to drain efficiently. Fascia – the little vertical section under the gutter, at the edge of eave that’s normally made of aluminium or timber. Female – any part that another part, such as a nut or a fitting, can be inserted into. Field measure – taking onsite measurements for accuracy, rather than relying on blueprints. Fill – the amount of additional soil needed to level out a block. Finial – a decorative or ornamental feature, usually at the top of a roof or canopy, or at the end of an object. Fire wall – a solid concealed space designed to prevent the spread of fire and smoke in emergencies. Fittings – items that can be removed without damaging a property, such as garden ornaments, lighting and drapes. Fixed price contract – a contract with a set price for all work. Fixtures – items that can’t be removed without damaging a property, such as bathroom suites, built-in wardrobes and kitchen stoves. Flashing – sheet metal or any other material used in roof and wall construction that protects a building from water. Footer or footing – a continuous thick concrete pad that supports the foundation wall or mono post. Form work – the outer timber frame that concrete is poured into. This is removed once concrete is dry. Foundation – the ground or surface a building is built on. Frame Inspection – the act of inspecting the home's structural integrity and its compliance to BCA. Framer – the person who erects the house frame, flooring system, interior walls, backing, trusses, rafters and decking, installs the beams, stairs, soffits and completes all work related to the wooden structure of the home. The framer builds the home according to the plane and must comply with local building codes and regulations. Fuse – a device often found in older homes, designed to prevent overloads in electrical lines. Gable – the upper triangular end of a home, beneath the roof. Gabled roof – a roof consisting of two sloping surfaces. Gate valve – a valve that allows you to completely stop, but not modify, the flow within a pipe. Ground – refers to electricity's habit of seeking the shortest route to earth. Grout – a wet mixture of cement, sand and water that flows into masonry or ceramic crevices to seal the cracks between pieces. Gutter – a shallow channel of metal or wood set below and along the eaves of a house to catch and carry off rainwater from the roof. Gyprock board – a panel with a core of Gypsum (chalk-like) rock, which covers interior walls and ceilings. Gypsum plaster – Gypsum formulated to be used with the addition of sand and water for basecoat plaster. Hip – a slanted ridge formed by the intersection of two sloping surfaces at an external corner. Hipped roof - a roof pyramidal in shape. Home run (electrical) – the electrical cable that carries power from the main circuit breaker to the first electrical box, plug, or switch in the circuit. Home Warranty – covers the homeowner (and subsequent owners) where the contracted building work is incomplete or defective and the builder has either died, disappeared, become insolvent during construction or has failed to respond to a rectification order within 30 days of issue. The cover lasts up to six years from completion or termination of the domestic building contract. Honey combs – when rocks in the concrete are visible and there are void areas in the foundation wall, especially around concrete foundation windows. Hot wire – the wire that carries electrical energy toward a receptacle or other device (normally the black wire). H V A C – an abbreviation for Heating, Ventilation, and Air Conditioning. I-beam – a steel beam with a cross section resembling the letter I. It is used for long spans or over wide wall openings, such as a double garage door, when wall and roof loads bear down on the opening. Inside corner – the point at which two walls form an internal angle, as in the corner of a room. Insulating glass – a window or door in which two panes of glass are used with a sealed air space between. Also known as double-glazed. Insulation – any material high in resistance to heat transmission that reduces the rate of heat flow. Interior finish – material used to cover the interior framed areas of walls and ceilings. Irrigation – a lawn sprinkler system. Jack rafter – a rafter that spans the distance from the wall plate to a hip, or from a valley to a ridge. Jamb – the lining of a doorway, window, or other opening. Includes studs as well as the frame and trim. Joint – the location between two touching surfaces, joined and held together by nails, glue, cement or mortar. Joist (ceiling) – supportive timbers that span between walls or other supports, which ceiling battens or the ceiling itself can be attached to. Joist (floor) – supportive timbers that the floor is fixed to. Laminate – a cabinetry finish where a layer of plastic is bonded to the particle board type cabinet or bench top. Can also be a material made by bonding several layers of material together, for example laminated glass is several layers of glass. Landing – a platform between flights of stairs or at the termination of a flight of stairs. Often used when stairs change direction. Left handed screwdriver – a joke tradies often play on the new apprentice. Level – true horizontal. Also, the name of a tool used to determine if a surface is level. Lintel – a structural item, such as a steel or timber beam, that carries loads over an opening. Load bearing wall – this includes all exterior walls and any interior wall that is aligned above a support beam or girder. Louver – a vented opening into the home that has a series of horizontal slats. Male – any part that another part, such as a nut or a fitting, can fit into. Mantel – the shelf above a fireplace. Also used to refer to the decorative trim around a fireplace opening. Mickey Mouse – a perfectly finished task with no flaws. Molding – a wooden strip with an engraved, decorative surface. Natural finish – a transparent finish that does not seriously alter the original colour or grain of the natural wood. Natural finishes are usually provided by sealers, oils, varnishes, water repellent preservatives and other similar materials. Niche – an alcove or indent in a wall. Often used in showers or as a feature in a hallway. OC – Occupation Certificate. You will require this certificate if you intend to occupy or use a new building, or change the use of an existing building. Open hole inspection – when an engineer (or certifier) inspects an open excavation to determine the type of foundation that should be installed. Outside corner – the point at which two walls form an external angle. Overhang – the part of the roof that hangs out over the outside wall. P trap – the curved, U section of drainpipe that holds a water seal to prevent sewer gasses from entering the home through a drain. Particle board – a manufactured material formed by bonding together flakes of wood and pressing them in to a dense sheet. Partition – a wall that divides spaces within any story of a building or room. Pier – a column of concrete used to support other structural members. Pitch roof – a roof sloping downwards on both sides of a central ridgeline. Often refers to a sloping roof constructed of individual rafters rather than trusses. Plasterboard – a rigid insulating board made of plastering material covered on both sides with heavy paper. Plumb – exactly vertical and perpendicular. Plumbing rough in – when a plumber installs plastic drain and waste lines, copper water lines and gas piping to fireplaces. Plumbing stack – a plumbing vent pipe that penetrates the roof. Point load – the point where a bearing/structural weight is concentrated and transferred to the foundation. Pressure Relief Valve (PRV) – a device mounted on a hot water heater, designed to release any high steam pressure in the tank to prevent tank explosions. Primer – the first coat of paint when a job consists of two or more coats. Primer is formulated to seal raw surfaces and hold succeeding finish coats. It is recommended on all wall and ceiling surfaces prior to painting. Property survey – a survey that determines the boundaries of your property. The cost depends on the complexity of the survey. Rafter – an individual timber framing item used in roof construction. Supports the roofing material. Rake – sloped or slanted. Render – a mixture of cement and mortar used to cover a wall surface. Retaining wall – a structure that holds back a slope and prevents erosion. Ridge – the horizontal line where two sloping roof surfaces meet. Root barrier – a method designed to protect a house slab from the roots of nearby trees. Schedule (window, door, mirror) – a table on the blueprints that list the sizes, quantities and locations of the windows, doors and mirrors. Septic system – an onsite waste water treatment system. Services – supply or distribution pipes for hot and cold water, steam or gas. Also refers to power cables, telephone cables, lift machinery, transformers, drains and ventilation ducts. Setback – how far from the front boundary a property can be built. Skirting – moulding to cover the joint between the floor and wall. Slab on grade – a type of foundation with a concrete floor, which is placed directly on the soil. The edge of the slab is usually thicker and acts as the footing for the walls. Slab – concrete that has been formed up and poured. Smoko – tradie slang for a break. Soil test – a test conducted to determine how a house must be built. Establishes how likely it is that the soil will move, expand and contract with different levels of moisture content. Span – the horizontal distance between eaves. Spec home – a house built before it is sold. The builder speculates that he can sell it at a profit. Specifications or specs – a written document in specific detail about construction materials and methods. Suspended ceiling – a ceiling system supported by the overhead structural framing. Switch – a device that completes or disconnects an electrical circuit, such as a light switch. Trimmer – the vertical stud that supports a header at a door, window, or other opening. Truss – an engineered and manufactured roof support with zigzag framing. Essentially does the same job as a rafter but is designed to have a longer span. Undercoat – a coating applied before the finishing or topcoats of a paint job. It may be the first of two or the second of three coats. Also see prime coat. Underlay – a material installed under carpet to add foot comfort, isolate sound and prolong carpet life. Utility easement – the area of Earth that has electric, gas, or telephone lines. These areas may be owned by the homeowner, but the utility company has the legal right to enter the area as necessary to repair or service the lines. Variation – a written document that modifies the plans and specifications and/or the price of the construction contract. W C – an abbreviation for water closet or toilet. Waffle pod slab – a floating reinforced concrete footing and slab system constructed on top of the ground. It consists of perimeter flooring and a series of narrow internal beams or strip footings with one metre centres running each way. Walk through – an inspection of a home during construction to confirm finishes and selections. Weatherstrip – narrow sections of thin metal or other material installed to prevent the infiltration of air and moisture around windows and doors. Weep holes – small openings that allow moisture to escape. Is there something we’ve left out? Or do you need help deciphering your custom quote? Get in touch with Merino Homes today! Great post, I conceive people should learn a lot from this site its very user friendly. That is great to hear, having good feedback like this is always fantastic. That is wonderful to hear! we always love good feedback like this!